Sir James also had aspirations of becoming a media baron, and was driven by his own experiences to promote higher standards of journalism. Sir James also had aspirations of becoming a media baron, and was driven by his own experiences to promote higher standards of journalism. He believed newspapers had a much larger influence on the community than radio or television, and needed to be run ‘properly and constructively’. In 1976, while engaged in a legal battle with the fortnightly satirical UK magazine Private Eye over allegations made about his involvement in the disappearance of Lord Lucan, Sir James began making efforts to buy a newspaper of his own. 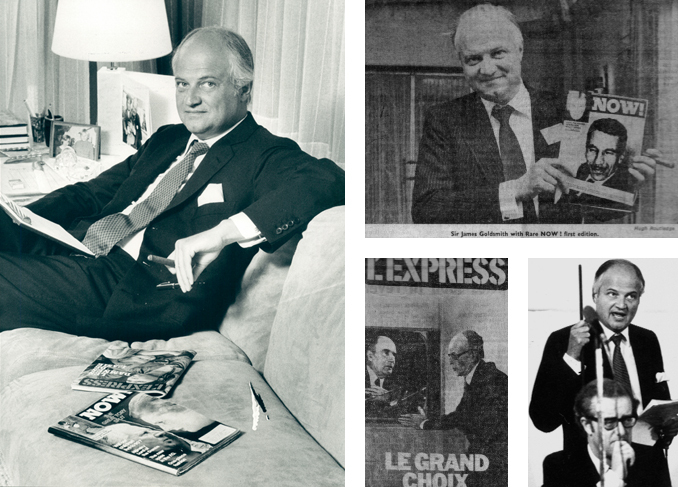 Attempted takeovers including the Observer and the Daily Express failed, and in 1977 he turned to France, where he bought a controlling stake in leading weekly news magazine L’Express. In 1979, still unable to buy a significant British newspaper, Sir James began planning his own weekly British news magazine. Now! Magazine, launched in September 1979, ran for eighteen months, with circulation peaking at around 400,000 for the first four issues. The magazine faced considerable challenges: a smear campaign by Private Eye, the death of its star journalist Patrick Hutber in a car crash, a television strike which affected the magazine’s launch and promotion, and another recession which hit Britain in 1980. After a year, circulation was at 135,000, compared to a 250,000 forecast, and falling. Facing losses of £12m a year, and unable to maintain a high enough circulation to attract advertisers, the magazine closed in April 1981. Sir James said it was one of the most painful business decisions he ever made. In 1986, Sir James, through Generale Occidentale, also offered a counterbid for Presses de la Cite, France’s second largest publishing group; followed by a bid for private French television station La Cinq in 1987. Sir James had strong views on journalism standards and press freedom, and believed the Press Council needed to set and adhere to more professional standards, particularly around conflicts of interest. He also questioned whether jury deliberations should be published before a verdict was delivered. In September 1981, Sir James created a £50,000 prize for the best investigative journalism into subversion in the media. He also wrote about his own experiences with criminal and political libel (mainly with Private Eye and also German news magazine Der Spiegel which later admitted its East German bureau chief, Diethold Schroder, was a Stasi agent who had been disseminating disinformation through the magazine’s columns) and set up a special libel fund to help those ‘wrongly attacked’ by Private Eye or the media.